my husband and i started near two months before halloween. 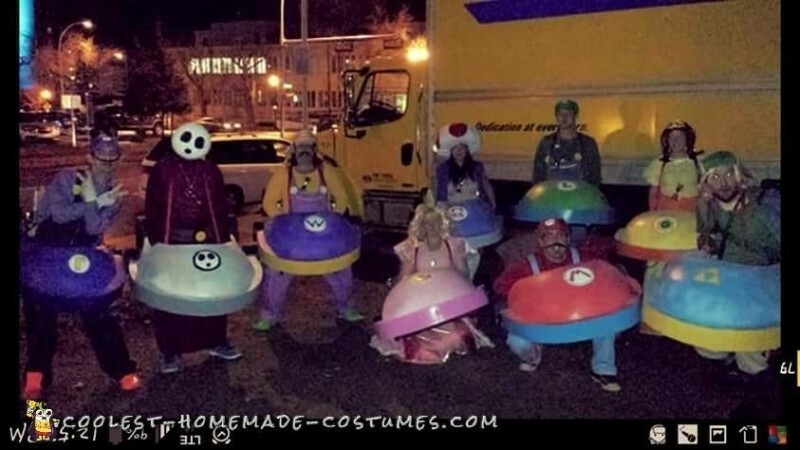 fisrt off, i have always wanted to do a mario kart theme for halloween, the game is a favorite. 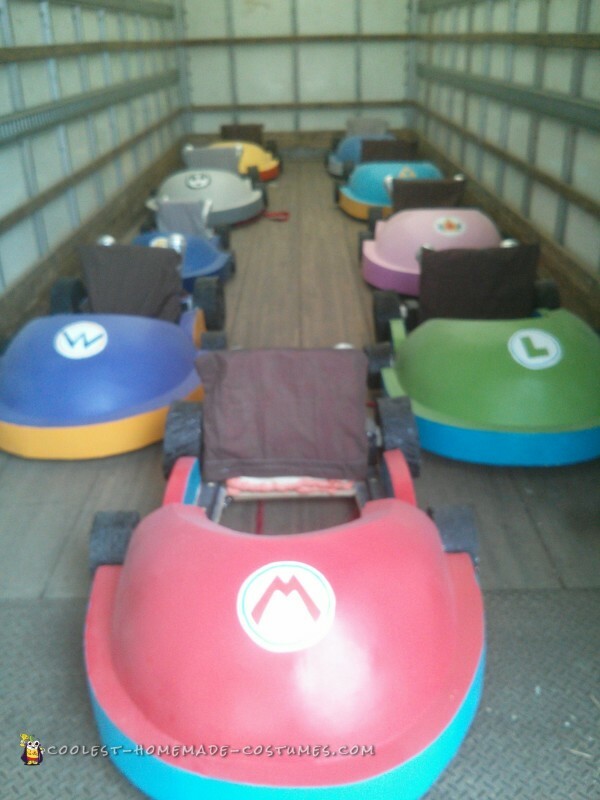 we started with four characters and grew to nine mario karters. the building process was long, the spray foam we found easiest to shape then applied the pieces to a plywood base with 2×2 under for stability. drywall mud was applied to the foam to make a smooth paintable surface for everyone to do their own paintjob and symbols.the tires and seat are also foam just molded and shaped. the exhaust is slurpees cups taped onto a cut water bottle with silver tin tape. pillow cases cut sewn and velcroed on to fit. the wheels are held on with small dowel doubled up to use as handles for steering around obstacles.using double hooked dog leases and eyehooks to hold them on oursleves. one of the best parts was “driving” them up one of the busiest streets here in edmonton alberta for seven blocks. ( japser ave). the looks the honks and the constant barage of photo opps made the whole thing worth it. we all had so much fun, its gonna be hard for us to top this past halloween. 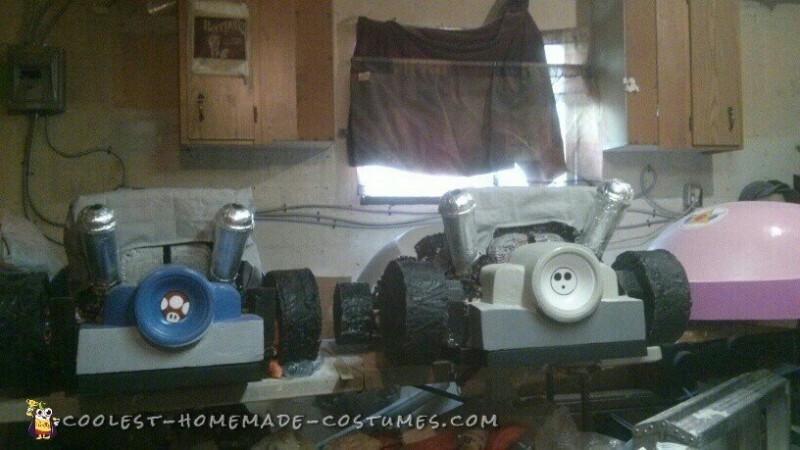 we built them to go to a local radio station halloween concert. a few smaller local bands (stryker, the wild) with buckcherry and godsmack headlining. we were hoping for group prize but ended up walking out with second place and a $3000 cheque.alothough that doesnt nearly begin to cover costs,lol. being a stay at home mom with kids off at school i found myself constantly working on these and after work my husband would get as much done as possible. i cant even begin to explain the dreams that came along with the frustration of these nine cars. and the fact that we actually had to rent a giant moving truck to get them all downtown to the same place for the party. i tend to go a bit hard when creating which really helped this project progress to this point. looking online i didnt see any really worthy karts, mostly a card board box that my girls would make for their klitten or something similar. i really wanted these to stand out in a crowd, thats why i say driving them down the busy road was amazing. im not an attention seeking person, so i was deffinettly out of my element, but afterall isnt that what halloween is all about?